After this week of experimentation I have a bit of a confession to make, I think I’m starting to get over my deep seated phobia of pink. You see, I keep making pink cocktails worried about their possible girly appearance only to be consistently blown away by their amazing flavor. The Clover Club, like the others before it, is truly a delicious pink cocktail. In reading Gary Regan’s recipe in the Joy of Mixology one thing struck me as interesting. He said the the cocktail “isn’t much to talk about” when made with grenadine instead of raspberry syrup. That got me thinking. What is it about the raspberry syrup that makes it so much better in this application? What was the grenadine lacking? So, I decided this week, rather than focusing on a number of different recipes, I’d use only Gary’s recipe but change up that other key ingredient, the fruit syrup. Since Gary’s recipe calls for adding the syrup to taste I went with my standard sour ratio and added 1/2 oz of syrup for each cocktail. Here’s the recipe I used. Store bought grenadine wasn’t even a viable option so I decided not to even try that. Instead I went with homemade grenadine, Torani raspberry syrup and homemade raspberry syrup. Homemade Raspberry Syrup: I decided to start my experiments here, primarily because I love making new ingredients. This was a simple one to make. I followed the same basic recipe that I used for my strawberry syrup. The syrup is a beautiful light red and the flavor of fresh raspberries really comes through. In the Clover Club you can really taste the raspberry coming through. The drink is less sweet than I expected but it’s actually just the right balance. 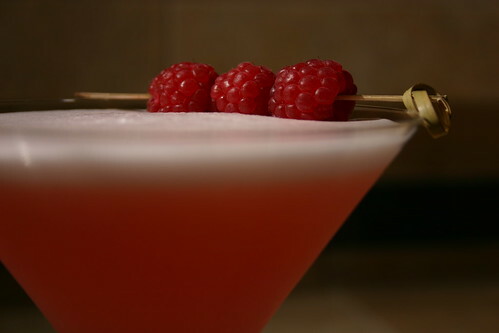 Any sweeter and it would begin to dominate and the raspberry flavor would over power the gin and lemon juice. Torani Raspberry Syrup: I picked up a bottle of Torani Raspberry Syrup from Cost Plus World Market. Interestingly, it’s not bad at all. It’s slightly sweeter than my homemade syrup and not as natural tasting but overall still very good. If you don’t have the time or inclination to make your own this is certainly a reasonable option. Homemade Hibiscus Grenadine: I love this grenadine recipe but in the Clover Club it doesn’t shine through as well as the raspberry does. I found the subtle flavors of the grenadine were masked by the gin and lemon juice. That said my grenadine is about 4 months old so it may have lost some of its intensity. If you’ve got the time and want to put in the effort make some raspberry syrup of your own. 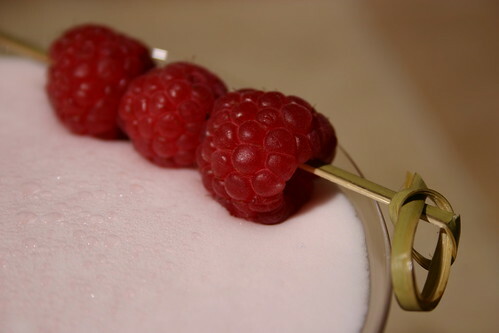 Your Clover Club will be much better for your efforts. The Torani syrup is definitely a good option as well but the flavor won’t be exactly the same. Finally I’d suggest using a gin on the bolder side. Don’t bust out your Bombay Sapphire for this, it’s flavors will be lost completely. I hope with this addition you continue to enjoy your delicious pink cocktails as much as I will. You have a really nice egg white head on that drink. Mine is rarely that nice unless I’m using eggs laid that very day. You have a secret? Or is it my junior shaker causing my poor looking clover clubs? Can’t say that I have a secret per se. The key to nice frothy egg drinks is to shake the crap out of them. I give each one at least 30 seconds of hard shaking to get the egg white nice and frothy. You mentioned your shaker is small. If there isn’t enough room for the ice and liquid to move around you’re not getting enough aeration. Try a bigger shaker and I bet your Clover Clubs look amazing. There is a secret: shake dry with the coil from your hawthorne strainer. Add ice, shake again. Pour.